*update. Found another method. still open maya with mdg time is faster. But this is not half bad. the “om_plug_as_double_mdg_set_time” function is the fastest I could find. be careful with currentTime eval=False and cmds.keyframe. Scroll down for the script. Soooo I had to export a bunch of data (10k+ maya files) for some dataset. Which forced me to find a fast way to export attrbutes per frame. And I dint want to have to dive into a c++ plugin or anything. So I compared a bunch of different ways that i know to getAttr and updating the maya time. 1. Dont use cmds.currentTime(frameNr, eval=False) !! This results in the attribute dg not being evaluated. sooooo its useless. This only evaluates the active anim layer’s keyframe data. And changing the active anim layer in mayapy is a nightmare soooo… yeah don’t use it. Also it only works if there are keyframes set. So a channel with a constraint will not return any value. So for testing i made a simple sphere and 2 additive anim layers with some animation in them. cmds_get_attr_cmds_set_time 4.07231167047 cmds_get_attr_no_eval 0.142337732946 = ERROR RESULT IS NOT CORRECT!!! cmds_get_attr_arg_time 0.188162308316 cmds_get_attr_om_set_time 0.367623159295 mel_get_attr 0.211408009643 pymel_get_attr_om_set_time 0.466954109253 pymel_get_attr_arg_time 0.274113534882 cmds_eval_keyframe_om_set_time 0.0870191721787 = WARNING RESULT IS NOT CORRECT WHEN USING ANIM LAYERS or no keyframes exist!!! om_plug_as_double_om_set_time 0.159895729674 = FASTEST RESULT! cmds_get_attr_no_eval 0.142337732946 = ERROR RESULT IS NOT CORRECT!!! cmds_eval_keyframe_om_set_time 0.0870191721787 = WARNING RESULT IS NOT CORRECT WHEN USING ANIM LAYERS or no keyframes exist!!! om_plug_as_double_om_set_time 0.159895729674 = FASTEST RESULT! Timing with a heavier scene with skinning and constraints. cmds_get_attr_cmds_set_time 8.21378763774 cmds_get_attr_no_eval 0.0179609034819 = ERROR RESULT IS NOT CORRECT!!! cmds_get_attr_arg_time 0.484571124028 cmds_get_attr_om_set_time 6.1720235551 mel_get_attr 0.494029596401 pymel_get_attr_om_set_time 6.14228203626 pymel_get_attr_arg_time 0.499620215035 cmds_eval_keyframe_om_set_time 0.00708293210846 = WARNING RESULT IS NOT CORRECT WHEN USING ANIM LAYERS or no keyframes exist!!! om_plug_as_double_om_set_time 0.468321232931 = FASTEST RESULT! cmds_get_attr_no_eval 0.0179609034819 = ERROR RESULT IS NOT CORRECT!!! cmds_eval_keyframe_om_set_time 0.00708293210846 = WARNING RESULT IS NOT CORRECT WHEN USING ANIM LAYERS or no keyframes exist!!! om_plug_as_double_om_set_time 0.468321232931 = FASTEST RESULT! Timing becomes more clear this way. Code should mostly speak for itself. The normal method of getting an attribute. :param obj: object string name i.e. "pSphere1"
:param attr: the attribute to check i.e. "tx"
:return: a list of values per frame. Doesnt work correctly as the attribute does not update. but using the time argument of the get attr. Definitly the fastest method if you dont want to use open maya. using open maya to change the time. ## Slight speed optimisation, this way we dont have to construct the string every time. Using pymel get with openmaya set time. pymel basically uses the openmaya api so should be faster. WARNING DOESNT EVAL CORRECTLY WITH MULTIPLE ANIM LAYERS!! Use the cmds.keyframe function to evaluate the keyframe. Its really fast! but .... doesnt eval correctly with anim layers. Getting the plug from openMaya. Then create a time mdgContext and evaluate it. This is the fastest with layer compatability... however i suspect there to be issues when doing complex simulations. ## The creaction of the MDG context takes the longest! print "Duration for each function 100 times: "
## And report the total duration. So a while ago a friend of mine, Perry Leijten, asked me to help out with seemingly a simple problem for his awesome skinning tools. i.e. all neighboring vertices in separate groups. Simple enough i thought and had a crack at it. Lots of hair later, 4am, birds chirping and I had a working version… that being immensely slow. After some tinkering and brainstorming we had a version that could do vertex sorting on a 40k vertex mesh in about 1 second. This got implemented in his skinning tools. Now about 6 months later I revisited the problem and got a speed improvement of about 70%. Sooo I thought it would be nice to make a post about it. Hopefully the comments in the code speak for themselves. If not and you have any questions feel free to ask in the comments. 1. Create a poly sphere in maya . ## Util needed for the old maya vertex itter. This system finds vertex groups. So a vertex is a house number, and the connecting vertices are neighbors. Think of it as neighbors living in houses but the city planing is horrible!. City planning wants to divide the people in districts. But they messed up the house numbers so they dont know who lives near who. So we have have a list of house numbers and we want divide them into groups! We will ask house nr 1 if they have a moment to talk about ... their neighbors. We ask on what number their neighbors live and we write everything down in our BIG NOTEBOOK. We walk over to this neighbor and ask the same question. When we no longer find any neighbors that are connected, we tear off the paper from the BIG NOTEBOOK and continue on the next. And call this group district one. Now we go to house nr 2. We check if we already talked to house nr 2 while looking at neighbors!. If we did, we will go to nr3 etc. ## Create a vertex itterator loop. ## Empty set to keep track of who we talked to. districtList =  ## < OUR BIG NOTEBOOK!!! ## For every index in our provided set. Get the connecting / neighboring vertices. ## An empty set that holds all house numbers. ## If our current index is not in the talked to list. We can process it. ## this nr is part of our list and not seen before. ## As long as we have neighbours we need to keep asking around. ## Empty set to keep track of all the new neighbours we are about to find. ## For each neighbour we currently know of. ## If they are on our list and we have not talked to them before. districtHouses.add(neighbour) ## Add them to our current district. ## We are done with asking all the neigbours we knew of ... so now we continue with all the new ones we found. ## First make a poly sphere of 200 Subdivision Axes and 200 Subdivision height. ## then run this script. ## Mock selection of vertecies. ## Using cmds and string conversion, as its faster then pymel. ## Start a simple timer to know how long it takes. Because sometimes python is not complex enough …. Recently I had a task to connect to an existing server to get some data via python so I had two options. Handle all connections myself, communicate with the database in python, cross fingers and hope I would not break anything. ORRR find a way to call C++ from python and use the existing libraries. 2) No external dependencies. Just standard python and standard C++. Seeing as there were only a few beginner resources about this online I thought I’d make a step by step tutorial about it now that I kind of figured it out :). I can’t show how I implemented it with existing code but hopefully the example should make you understand how to do the same. seeing as I’m not a C++ expert I’d like to note that my C++ code might not be perfect but hopefully it will help you understand. Create a c++ and pythonproject. Add some code that can later be called from python. 1.3) Give it a name and location and click ok.
*Note that in some tutorials / online resources they refer to this as a .so (shared object / shared library). Also one thing to recommend. If you build release and debug the folder locations change. This makes it annoying for python as you have to swap between folder paths. But you can also just change the build location for the debug and release to be the same folder path. 1.7) To be consistent with good coding practices lets make a header and cpp file. And if you want to be tidy create a proper “headers” folder in your project windows folder. Click ok and now you should have a .h file. 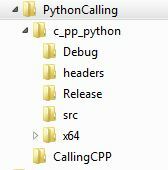 Please make sure that whatever you called your .h file that you call the .cpp file the same. This will make it easier to manage our files and code in c++. 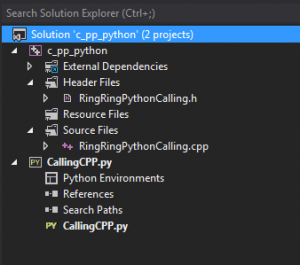 1.8) Creating your python project. Add -> New Project -> select a Python application. 2) Give it a name and put it in a logical location. 3) Now your solution should look something like this. 4) Now right click the project and click. Now in order to be easily able to debug our code in python and c++ at the same time do the following. 3) This now allows the c++ code to be debug able. 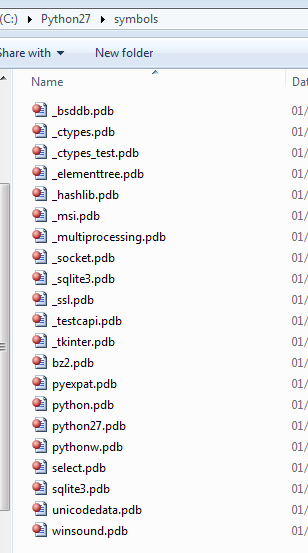 And download your corresponding pdb files for your python version. 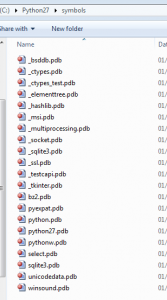 5) Create a folder called symbols in your python install folder and put the pdb files in there. Click on the folder icon and add the folderpath to the symbols there. 7) You might also need to click “Load All Symbols” Once for it to work. 8) Do note that enabling this makes running your python file slower. So sometimes its recommended to just disable it. Especially once the c++ work is done or you are not making modifications in the c++ file. Open your header file by double clicking on it. Now I wanted to find a use case for this tutorial instead of just doing a hello world. So the code I have written here would be the basis of doing a c++ matrix or array class but focusing on the communication between c++ and python. For example. Imagine you are taking skin cluster data from maya and you want to do some special smoothing operations on the skin cluster data. So on every row you have a vertex. And every column corresponds to every influence. In python iterating over all these numbers can be quite slow. So if you send the vertex weight information over to c++ and do your math magic there it could be a lot faster. // c++ Note: The ifndef, this is useless for python but can become usefull if the extension becomes a lot bigger. // c++ Note: This basically prevents the header from being compiled more than once if its used in multiple area's of a project. // c++ Note: define the this word. // Name spaces are a good habit to get into as it makes it easier to extend your project. // Also makes your code more readable. // Note that opinions differ on this. Do a search on stack overflow to give you months of reading material on namespaces haha. bool valid; // Valid boolean to keep track if the class is still valid to be called from python. // This is a deconstructor. it is the same name as the class but with a tilde ~ infront of it. // This is called when the class is deleted. // Lets create a double pointer pointer to use as an example of passing arguments around. A double pointer pointer can be SEEN as an list of lists in python. Its basically a list of pointers to other pointers. // We need the info of the array because in c++ we can not query how big an array of pointers is. int columns; // This will hold the info on how manny collumns the array has. // As you can see all functions return something. Even though most functions do not need to. // However there seems to be a problem in release mode where python starts garbage collecting the class object. // So returning a value prevents that from happening. double ** GetArray(); // actually getting the array back again but the actual pointer. double ** GetArrayCopy(); // actually getting the array back again but this time a copy. // Here we end our if. So the compiler knows where to end. #include <stdio.h> // Needed for the print function. 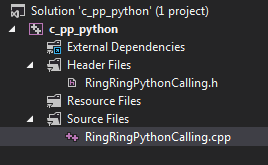 #include "RingRingPythonCalling.h" // We need to include our header as else it does not know how the class is build up. Here we put all our class functions and normal c++ functions. Python will not be able to call these functions directly. My guess is there is a way but I have not found it yet. See the C wrapper how we actually solve this problem. : rows(0), columns(0),valid(true)// We initialize our rows and columns to 0. // This is the constructor. Its like the __init__ in a python class. // We set the valid bool to true so we can check from python if the object still lives in memory. // This is the deconstructor. It gets called when the object is deleted from memory. // Here we set our boolean to false so we can check from python if we can still use the class. // In here we should also delete any other objects i.e. our array. // But I'll leave that for now. // Creates an array from the python data. // First we create an empty array with the correct size. // And now we can assing our python array to our array member. // Creates an empty array with the set size. // So printing it we just itterate over the rows and columns. // A simple smoothing function. // Im sure there are 1000 ways to do this better but you get the idea. Sleep((DWORD)0.00001); // Required for python. // This function is not really correct as if the object gets deleted so does this function. // But python will still hold a version of it and thus be able to call it and know that its no longer valid. This is a ctypes python example. It shows how to communicate with a c++ compiled dll. The reason why we do this is mainly performance or to make python communicate with other libraries. In this example we will create a 2d array (matrix) in python and send it to c++. In c++ we will smooth it and print it and send it back as example. Also i descided to keep the example flat in just one function. and not put it into a python class so its easier to understand. ## Define the size of the matrix we will make. ## I have seen some resources where people prefer to do C types in caps. ## I kinda like it too so Im doing the same here. Its just a personal preference. ## This variable can be send to a c function that takes " double * "
## So every pointer points to a list of doubles. ## Initialise our c++ class and store it in a variable. ## Lets check if our object is still valid. print "1) Are we good to go? ", "Yes " if lib.is_valid(obj) == 1 else " No "
print "Press enter to continue!" ## Lets create the array in c++. We need to also inform c++ how big our array is when we created it. ## Note that we are putting the return value into a result. This somehow prevents python from garbage collecting. ## now the garbage collection should only happen when a result goes out of scope but this seems to do the trick. print "2) We created an array in c++"
## Lets print it from c++. print "3) We smoothed the array by 50 % "
## Now lets print it from the python side. print "\tEnd printing from python." print "\n4)Isnt this nice even though we changed it in c++ we still have access to the values from python!!" print "5)We made a copy of the array "
print "6)We smoothed the array by 50 % again "
print "\nPrinting copy from Python"
print "\tEnd printing copy from python." print "7) As you can see the copied array did not change after the smooth"
print "8) But our c++ array did of course :) \n"
print "Now i also did some speed comparissons so you get an idea of the performance increase." print "Please do note that there are a LOT of optimisations that can be done on the Python and C++ side." print "Lets reset the values in the arrays and lets create a python equivalent with a list." print "Press enter to start the performance test!" print "Calling the c++ smooth function 100.000 times"
print "\nPrinting the c++ array"
print "Calling the python smooth function 100.000 times"
print "\nPrinting the Python list"
C++ will most likely still be below 1 second (depending on your machine). Ony my machine in release c++ is about 15 times faster than python. Note that running it in debug is slower than in release. ## The python smooth function. print "Press enter to exit"
Now the code should speak for itself and its comments. 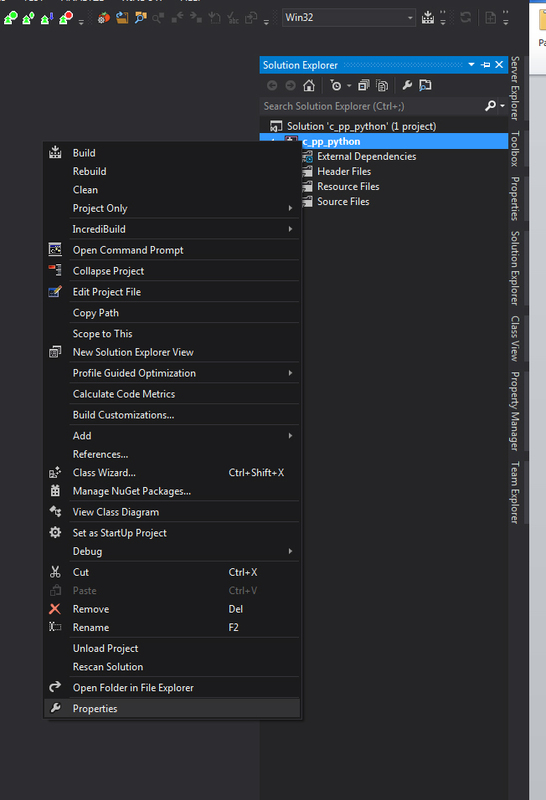 If you press F7 it will build the project into a DLL. 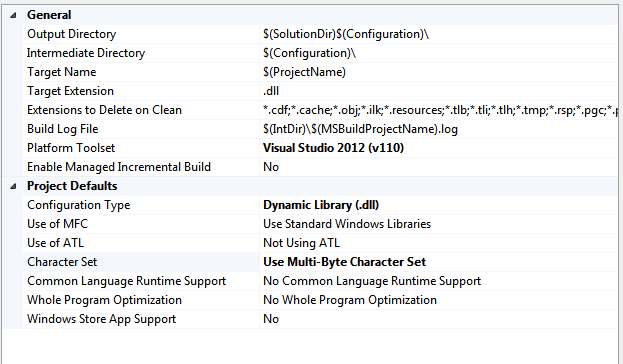 alternatively you can go to Build –> Build solution. 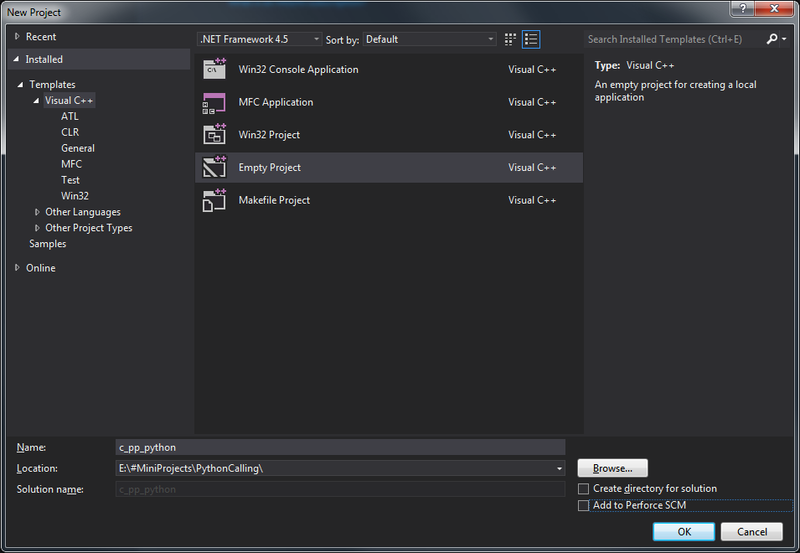 Because a python file doesn’t need to be precompiled visual studio will only compile the DLL. Scroll down to the Problems and solutions if you run into any problems or errors. Seeing as you set the python file to be the startup file it will run the script. Here are the project files that you can download and test yourself. a: Check that you wrote the name correctly of the header file. At Additional Include directories add the folder where your header file is located. 2) Debugging pops up the “Python Symbols Required” window. You need to add the python symbols of the correct version. Click download symbols it will take you to this link. ② MAKE SURE YOU GET THE RIGHT VERSION. 2. Then you will see the python window appear with the version in the header. Now my version is 2.7.3 so make sure you also download the pdb for your corresponding version. 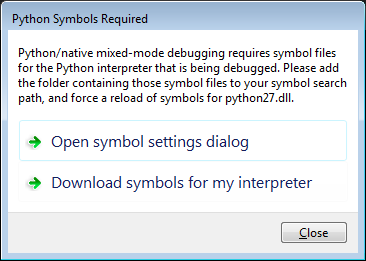 Else the “Python Symbols required” dialog will keep popping up. 3) Python command window pops up and closes instantly. This sometimes happens with the symbols messing with the python tools for visual studio. The easiest workaround is to run the script without debugging. So instead of pressing F5 press Ctrl-F5 untill you fix your bug. ① If you get this error the object is most likely being garbage collected by python. ② So Make sure you store the object in a variable returning from a c++ function. If your c++ function does not need to return anything just give it a int as a return value. Additionally. I noticed that there is a more severe underlying bug that I could not find the source of. ② Just add a Sleep(0.0001) at the end of the function. As seen in the smoothArray function. ③ My guess is python is doing its own memory management after the function is called and moves the objects around. But the function returns to soon so python cant call the function again. This mainly happens in release and not in debug so it’s a nightmare to find. So a while back I wanted to create a background thread that checks the user selection at any given point. Now I know I could have done this with a script job but I wanted more flexibility so started looking into threading. Now threading in maya is somewhat a nightmare as threads are not safe so if a thread crashes so does maya. But I think I’ve come up with a “somewhat” stable version of threading. I am kind of cheating the function to run on the main thread. This way most Pymel functions will still work correctly without erroring out. Now be careful though: It can still be unstable especially when using print statements. The problem is that if one thread gets delayed and the other one starts that there is a slim chance that two or more threads try to do the same operation in maya at the same time. So for example they will both try to move object.vtx to different positions or print to the script editor at the same time it will result in a crash as maya does not know what to do with the situation. It also supports string and mel functions. ## Module description: Threading module that allows user to create a sepperate thread and run their own funcitons. loops a certain function at the specified interval. The function will never be called faster than it can run. so if the function takes 5 seconds setting the interval to less then 5 will not do anything. Also its a recursive function. So python might hit its recursion limit. if it does just increase the limit. threadName : obsolete for now. Exception : catch all as I do not know what can go wrong in other peoples scripts. ## Set the stop signal. ## If not we can just use an normal eval defered. Using cmds as its more stable then pymel. ## Call our start again. The evalDeferred is the most important part of this class. Without it there is a very high chance that maya will crash as it will most likely try to do two or more operations at the same time. and give it 10 subdivisions in each direction. Now if you are lucky maya dint crash and you will see a flag like motion without the timeline advancing. VERY IMPORTANT NOTE!!!. if you want to stop the thread run the following code. ## OR set the thread event. DO NOT REDEFINE THE “flagThread” variable as that will lose your chance to kill the thread. I hope this is of some use to someone. I guess you could even make a simple game with this in maya haha :D.
Justin Israel made an awesome extension for the Sublime Text editor called MayaSublime. But I noticed there is no auto completion file for the MEL syntax so I decided to generate one. The rest is generated by parsing all the MEL scripts and taking all “global procs” in the Maya installation scripts folder. Hope this is of some help to people still having to manage legacy MEL scripts ^^. Feel free use edit and or modify these files in any way you see fit. The zip file contains the MEL.sublime-completions and the Python file used to generate this file. 1) Copy the SublimeMelAutocompletion.py into your scripts folder. apiOnly = only generate the commands that are listed in the maya command reference. It will try to detect your user name automatically. Maya’s “pasted_” is history and maya root namespace. PASTED_ prefix attached to it. Resulting in a horribly messy scene that no one ever cares to clean up… until you have to revisit the scene and have to dive into the world of pasted_ nodes trying to find the correct shader etc. This will merge all the pasted nodes directly into the scene (root namespace ) without adding any prefix or suffix. (Only when the node all ready exists in the same depth it will add a number to the end). Mel and Python do go hand in hand at times. But I recently found a mel wrapper function that does this for you!!! And not only that it also adds the proper from module import function path as well! for example. Let say you have the following python script that connects two attributes. Save this to a file and store it somewhere in the maya scripts paths. *note i added the “rehash” to make sure the mel scripts are refreshed. While working on one of our pipelines I had to find a way to prevent artist touching certain object. But I still needed access to them in code and be able to modify and delete them. So I tried locking the objects and hiding them from the scene. But the problem was that they still existed in the outliner. So artists would sometimes clean the objects up or move them around. Heck one of the artists even accidentally figured out how to unlock the objects and delete it. (dont ask me how). So if you mark an object as an intermediateObject then it will no longer show up in the outliner nor will it be visible in the scene. The only way to still see it is by traversing in the hypergraph or knowing where you left it :D. Or doing a in Edit Deformers. *note as soon as you connect the intermediate object the transform will disappear. Printing and clearing output window. Recently I started to work on some maya startup scripts and wanted to print out some info in Maya’s Output Window. Would do the trick. However it doesnt. Turns out maya stores the stdout connection of the Output Window in the private __stdout__. Now after a few lines of testing I wanted to clear out the Output Window which turns out to be quite hacky. It does look very intrusive into the windows file system so I guess using this for linux or mac is out of the question. Save out vertex colors from Houdini. Someone asked me how to export vertex colors from Houdini. So I gave it a quick go to see how rusty my houdini had become and turns out it was horrifically rusty. Anyway without further ado … here is the script and otl. Mind that the otl is made in the learning edition. ## Get the filepath the user set. ## write our list of data and add a \n new line at the end of each item. ## Inform the user the save was successfull.